A few days ago, I was walking through the Berkeley campus at noon on a sunny November day. 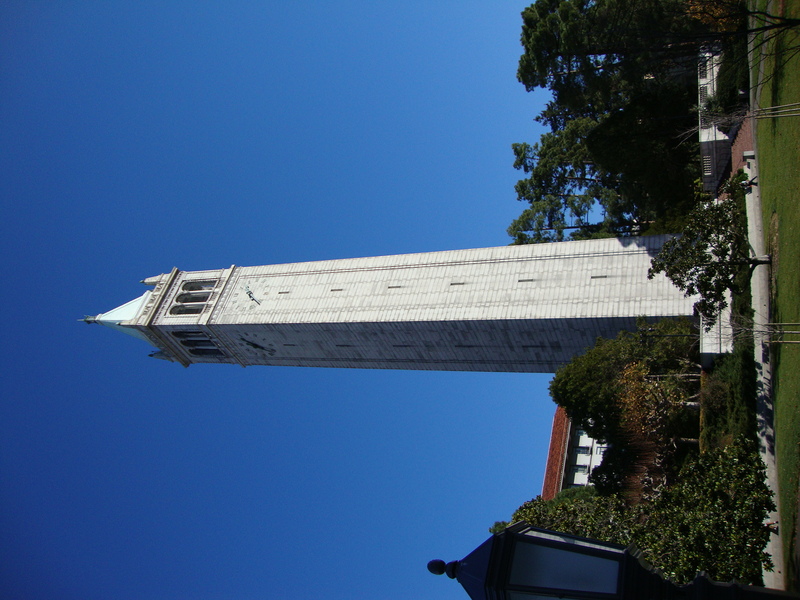 Towering above me was the recently-renovated centerpiece of the UC campus, Sather Tower, the Italian Renaissance-style campanile designed by John Galen Howard that was completed in 1914. As I walked, bells began chiming from up above in the campanile. Just as Proust’s eating a Madeleine brought back past memories, so did the chime of those bells. Their music evoked a moment five or six years ago when my American friend Susie and I were walking through the main square of Ghent, Belgium. 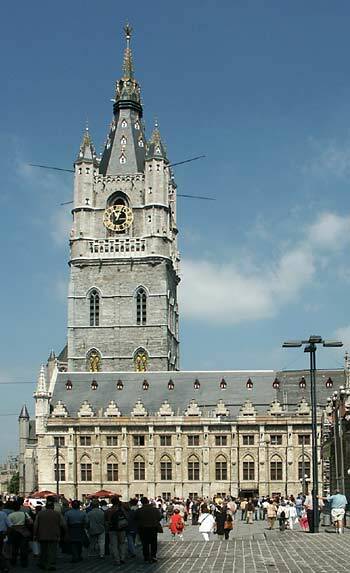 It was a rainy Sunday morning about noon, and the bells of Ghent’s landmark belfry, the Belfort, were ringing above. Susie turned to me and said: “Look. The door to the tower is open. Come on! Let’s go up.” I followed Susie inside. Up, up, up we climbed the narrow winding staircase. The higher we got, the louder were the bells—54, according to the guidebook–of the belfry, which was built in the 14th century as a fortified guard tower. From the small, stone window-slits, we could see the medieval square below, with its grey cobblestone streets, gabled houses and slate roofs. Upon arriving at the top, we saw, behind the glass of a box-like room, two carillon players, a man and a woman, playing a duet on an organ-like instrument. “My God,” gasped Susie. It’s Geert and Lizbeth!” The bells were so loud that I could barely hear what Susie was saying, but the expression on her face and the gestures she made indicated to me that she recognized the two musicians. And they, in turn, nodded their heads to Susie in recognition as they played. That day, we were the only spectators up in the tower. Holding our hands over our ears, we listened –for about 20 minutes –to the bell concert, all the while watching the fist and feet movements of the two musicians. Once the concert was over, the man and woman opened the glass door and came out to greet us. And what a coincidence it is, too, that although Susie lives most of the year in Belgium, the place I’m renting in Berkeley on Arch Street is just a block away from where she still owns a home! Such coincidences prove to me yet again how small the world is becoming, how people work and spend their time on different continents, and how interconnected we all are. They also underscore the power of memory and the Proustian experience—of how hearing chiming bells and seeing a campanile in one place can bring back the memory of music of another bell tower thousands of miles away.